Pharmaceutical drugs or Pharma drugs are chemicals designed to treat or prevent a medical condition. On the other hand, Cannabidiol or CBD is a cannabis compound with essential medical benefits that can also be used to treat medical conditions as an alternative. Pharma drugs are now known as traditional or conventional drugs since alternative medicines have been introduced to the market. CBD is one of the alternative medicines that we use when we want to have more organic or natural options for medications or when Pharma drugs simply fall short of our expectations. Often, we will hear debates on how the two are different or which one is better than the other. We already know the benefits of CBD, and most probably, we have taken one or two medicines throughout our lifetime, so we know their benefits as well as their effects. But what if we decide to take both, if so, does CBD interact with Pharma drugs? What are the pharmaceutical drugs, when taken with CBD, have potential interaction risks? How does Cannabidiol interact with Pharma drugs? 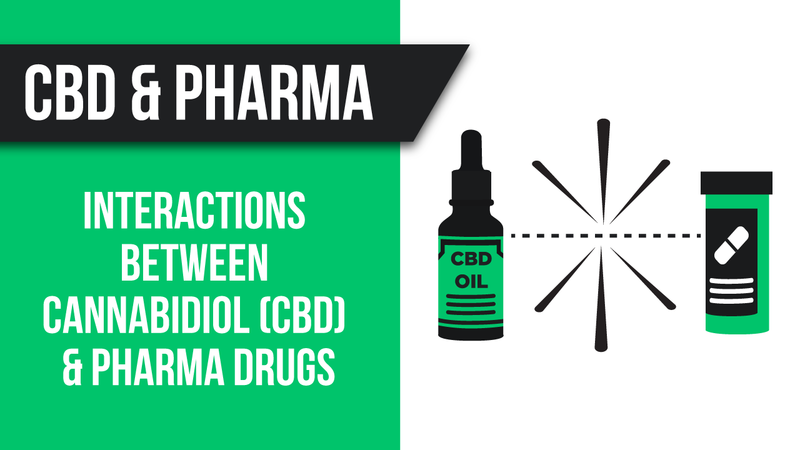 1 How Does Cannabidiol or CBD Interact with Pharma Drugs? 3 After Taking CBD, How Long Do Its Effects Last? How Does Cannabidiol or CBD Interact with Pharma Drugs? To truly address this question, we need to understand how CBD and Pharma drugs work, how they interact by themselves, how they interact together, or if they could interact with each other at all. Majority of pharmaceutical drugs are processed through the liver by enzymes called the Cytochrome P450 or CYP450 enzymes. They play an important role in the metabolism of medications we take. Metabolism of medicines occurs when they are broken down inside the body so they can take effect accordingly. However, CYP450 are the very same enzymes that metabolize Cannabidiol or CBD. So what happens when we take Cannabidiol at the same time that we take our prescribed medications? When CBD enters the liver, it will consume all the CYP450’s processing capability. Thus, other drugs taken with CBD will have varying effects than when we take them by themselves. Our body becomes fully occupied with processing CBD, and as a result, it will be unable to accommodate other pharmaceuticals that need to be metabolized. Since CBD takes up all the processing power of CYP450 enzymes, other drugs will not metabolize as well or as normal as expected. Some drugs, when taken with CBD, have the potential to be more potent than usual. There are three types of interactions between medications. The synergistic effect happens when the effect of two chemicals is equal to the effects when they are taken separately. This occurs when there is no significant change regarding the effects of medicines when they are taken at the same time. Their effects remain the same as when they are taken individually. The additive effect occurs when the effect of the chemicals has a greater effect than when they are taken separately. This means that one of the medicines, metabolized by Cytochrome P450, when taken with CBD, may cause it to be more potent and may prove to have disastrous health effects. Antagonistic interaction occurs when the sum effect of two chemicals is lesser than when they are taken simultaneously. This is caused by the increased excretion of the first chemical when interacting with the second one or even block the other one’s toxic actions. Considering the different interactions between medications, the interaction between CBD and medications metabolized by CYP450 can either be synergistic, additive, or antagonistic. One of the most appealing effects of Cannabidiol or CBD is its ability to increase feelings of relaxation and happiness. This greatly helps people who are feeling anxious and stressful. Consequently, people who are suffering from feelings of depression and anxiety are more likely to use CBD products. As expected, many people with these conditions might also be taking prescribed antidepressants. This is, of course, why antidepressant’s interaction with Cannabidiol is significant since they are more likely to be taken together. There are few documented reports on the negative effects of interaction between antidepressants and CBD. It might be that there are no significant adverse effects regarding the interaction between the two. However, it should be taken into consideration that patients may be hesitant to disclose CBD use for fear of denouncement. Also, there is also the lack of awareness that may make the patient unable to recognize effects that may be a result of their antidepressants interaction with CBD. Physicians are facing a challenge of prescribing the most suitable or fitting antidepressant to patients who are also using CBD. The more prescription drugs they are under, the more unlikely it is for the physician to isolate and monitor the effects of the interaction. Selective serotonin reuptake inhibitors or SSRI’s are drugs commonly prescribed to patients suffering from depression. There is a low to moderate potential risk in cannabis interaction. Many physicians prefer SSRI’s since the occurrence of negative interaction with other drugs seems more unlikely. Serotonin and norepinephrine reuptake inhibitors or SNRI’s are a newer class of antidepressants. Reports on adverse effects with their interactions with other drugs are also scarce. The potential risk of interaction is also low to moderate. Monoamine oxidase inhibitors or MAOIs have a high potential risk of interaction. There are reports on their side effects and threatening interactions with food and medications. Although there are no documented reports on the interaction between cannabis and MAOI’s, the use of the former is not recommended due to the latter’s notoriety. Tricyclic Antidepressant is one of the older antidepressants and has more reports on its unpleasant side effects than the newer ones. Some reports on life-threatening situations have emerged possibly due to the interaction with cannabis. After Taking CBD, How Long Do Its Effects Last? Patients may ask when they can use their prescribed medication like antidepressants after using CBD. This will give them an estimated time on when to take authorized pharma drugs from their physicians. This would have been an easier question to answer if the duration of the CBD’s effect is not so tricky due to its varying length with each person. So how long does the CBD’s effect really last? There is no general rule of law as to the duration of the CBD’s effect. Each person has a unique metabolism, and it plays a big role in how substances are processed in our systems. The kind of CBD and the dosage are also factors to consider on how long CBD’s effect will last. The emergence of Cannabidiol products is still in its early stages. It is still very young on the market due to the delay in the legalization of cannabis as alternative medicine. One of the effects of the delay is that studies on the interaction between CBD and Pharma drugs are few and are still far in between. Since its legalization, it is just now that the concerns about the possible harmful effects of taking CBD with conventional medicines are considered. As of today, the preferred reference on possible unnatural effects of the interaction between conventional and alternative medicines is based on what drugs do CYP450 enzymes metabolize. Research on the interaction between Pharma Drugs and Cannabidiol still has a long way to go. This is also the same reason why taking other medications with CBD should be considered with extreme caution; its interaction with the result of increased serum levels could prove fatal. Due to its early stages of research on interaction, medical and health professionals advise patients to diligently monitor the effects of Pharma Drugs and Cannabidiol especially when taken simultaneously. This will alleviate potential risks and will allow you to adjust your medication intake. One of the most conclusive researches on Cannabidiol is its characteristic as a strong blockage of CYP450 enzymes. This means that when taken with other drugs, it is dominant in its ability to monopolize the metabolizing enzymes and can trigger pharma drugs to react differently. It is, then, with extreme caution that the interaction between the two should be treated. Arguably, Cannabidiol may be one of the most revolutionary medical discoveries specifically in the pharmaceutical field. Its therapeutic benefits are undeniable, and its mild psychoactive effects make it more ideal for medical treatments especially as alternative medicine. We hope that more conclusive studies will be made as to the effects of interaction between Pharma Drugs and Cannabidiol. It is still best to consult a medical professional and discuss drug interactions when you are taking up CBD and other pharmaceutical drugs at the same time.